Tracey’s stunning monochromatic card stole the show for me this week. At first blush, it appears fairly clean and simple. Look closer and you will notice beautiful details such as tone-on-tone background stamping on the card base as well as the individual flowers, perfectly aligned borders and those fabulous fussy-cut flowers! She even carried the design through to the inside with even more gorgeous details. Just beautiful! Congratulations, Tracey, you’re my choice for A Cut Above! 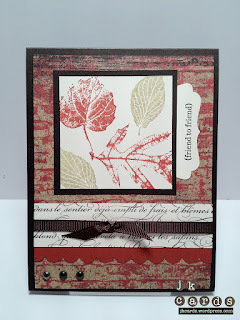 Patty's gorgeous card blew me away this week! Her attention to detail with the pretty lace trim at the bottom of the card and the fabulous ribbon slide, made this card a knockout for sure! 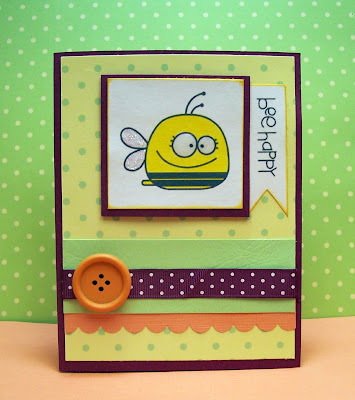 I love the fresh colours she used and the simple layers. The white accents make this card so pretty and feminine! What a lovely card! Congratulations Patty, you're my choice for a Cut Above this week! Oh my goodness, what a plethora of beautiful cards from which to choose! You all did such a wonderful job with Ann's sketch. But Justin's card stood out, calling my name from amidst the beautiful spring colors, whispering "Autumn, autumn" to me!!! LOL! 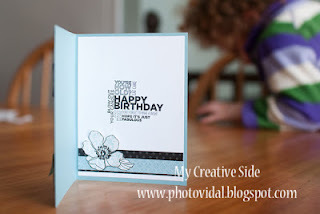 His creation is simplistic, but his choice of papers, colors and embellishments, combined with his beautifully-stamped main image, made a classic creation that would be suitable anyone. Congratulations, Justin, for being my Cut Above this week! Anne Marie's Choice: Alejandra B. So many fabulous cards to choose from this week! Wow! I just kept going back to Alejandra's bright and cheerful card. Isn't that little bee the cutest thing ever? Such a fun interpretation of the sketch with a crisp and clean design. Anyone would "Bee Happy" to receive this little cutie in their mailbox, for sure! Congratulations to you Alejandra, on being my choice for A Cut Above this week! I love Colleen's Easter card. The bunny and chick are beautifully colored and I love that one one of them is popped. The stitching around the card echoes the shape of the stitching and the color scheme is fabulous. In fact, I loved everything about this gorgeous card. Colleen, congratulations on being my Cut Above this week. 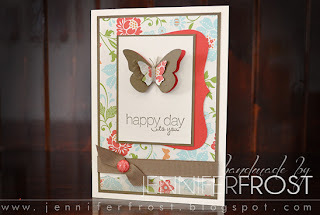 As usual you all blew us away with your fabulous creativity but in the end Jenn's card really caught my eye with it's simple beauty. 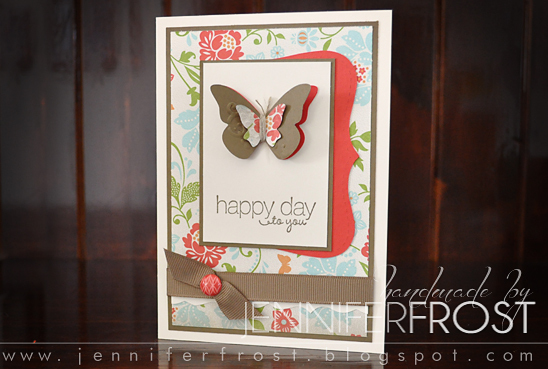 The clean lines, fabulous colour combo and gorgeous layered butterfly are striking and the top note shape added just the right contrast against the pretty patterned paper. I also love how she added the brad to the ribbon, just right touch with out over doing it. Congratulations Jenn on being my Cut Above this week! So many beautiful and unique cards to choose from this week! The attention to detail in Juliette's striking card grabbed my attention immediately, starting with the careful cutting of each of the Fabulous Florets flowers. The way she "popped" each flower off the card really catches the eye. I am loving the color combo she chose! It all coordinates beautifully. Juliette's card couldn't have followed the sketch more perfectly right down to the finishing accent of the trio of pearls at the bottom. 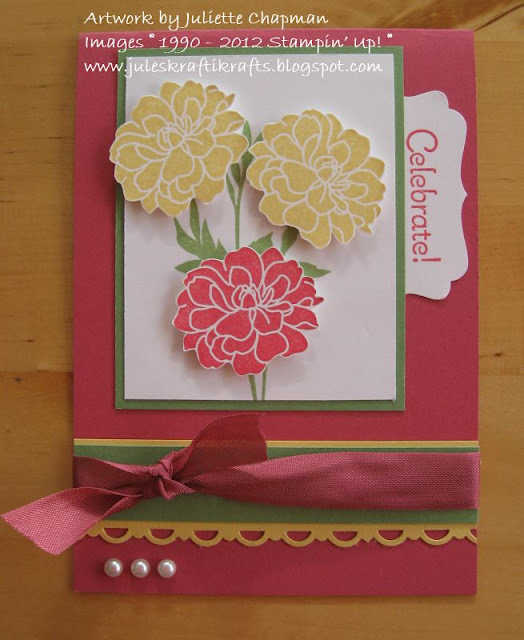 The "celebrate" greeting is perfect for many occasions! Congrats, Juliette, on being my Cut Above for the week! I certainly had a difficult time narrowing down my finalists for Headliner this week. There were so many fabulous cards calling out my name. However, I kept coming back to this delightful card by Kim. First of all, she nailed the sketch. The cute kitty stamp was a great choice for the image panel, and Kim colored it to perfection. The color combination is fresh and spring-like, and the twine bow is the perfect touch. I especially like how she stapled the sentiment into position. and the multiple mats! Congratulations, Kim, for being my choice for Headliner this week! Thanks to all for playing along with us at The Paper Players! Don't forget to come back tomorrow and see what the always clever Anne Marie has up her sleeve! Thank you so much Nance!! I am honored, all the entries were beautiful! congrats everyone! Wow I can certainly that you would have a hard choice narrowing this down to one choice. All these cards are just gorgeous and have interpreted the sketch beautifully. Congratulations Ladies! Thank you so much, Lesley for picking my card! I'm so honored! The cards were wonderful and it was a great sketch to work with. Congrats to the others as well!